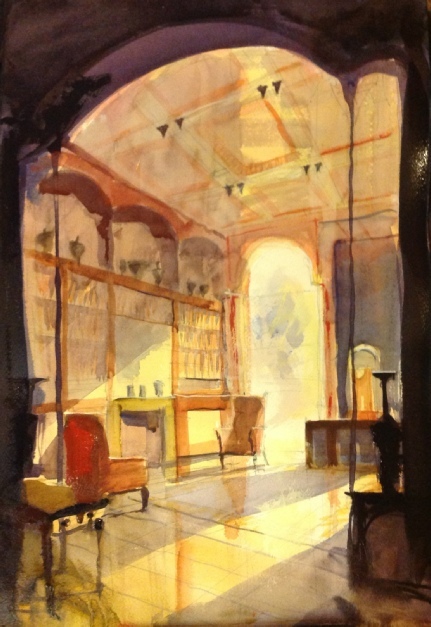 This evening, artist Simon Jones demonstrated painting the interior of a room at the Soane Museum, London. He is an architectural and landscape watercolourist, responsible for the public’s first glimpse of, among other things, The Olympics, Diana Memorial, British Museum Great Court, and many a Chelsea Flower Show. He has an academic background in architecture (BA, AADipl) and is a Fellow of The Society of Architectural Illustration and the Prince’s Foundation. 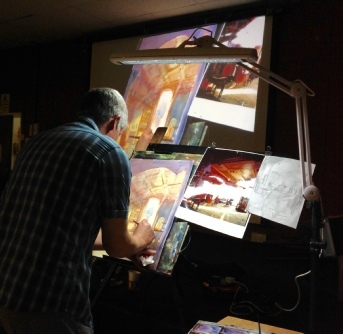 His watercolour landscapes have been exhibited widely including the New Academy Gallery, Waterman Gallery London, Prouds Gallery Sydney &c.
Pictured is Simon painting and his finished watercolour.